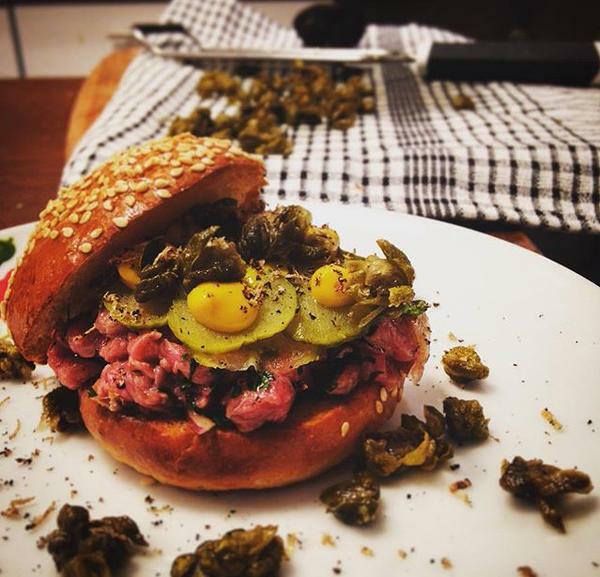 Le Bun, who do French American street-food, inc lots of tasty things in buns, start a new residency at Market House in Brixton on Monday 7th September, serving every weekday from 5.30pm to 11pm, until Friday 2nd October. Go for the burgers, but also their new sharing plates like raw tuna Provençal. "French American street food favourites, Le Bun, launch their informal Haute Cuisineeaterie in the heartland of London’s independent dining scene, Brixton. Taking over pop-up stronghold, Market House, Le Bun are launching a brand new experience: #PLATES, innovative and lavish sharing plates, to complement their luxury French inspired burgers. Running Monday to Friday evenings, for 4 weeks only, the residency crowns a whirlwind summer season for Le Bun, who have been popping up at festivals including Wilderness, Jamie Oliver’s Big Feastival and British Summer Time in Hyde Park. #PLATES will offer diners a taste of fine French cuisine with treats such as Raw Tuna Provençal, Duck ‘Fries’ Poutine and Steak Frites. The new menus will sit pride of place alongside Le Bun signature dishes Le Bourguignon Bun, Le Duck Frites Bun and National Burger Day highlight, Foie Gras & Summer Truffles Cheeseburger (bestselling Aged Brisket & Chuck Patty, Foie Gras, Shaved Sumer Truffle, Truffled Beef Jus, American Cheese, Brioche Bun). Le Bun founders Andy Taylor and Tim Talbot will be joined by chef Jeremy Wands as they bring their feast of French American classics under cover for the winter, ensuring street food aficionados can get their fix throughout the winter months."